Lobsters iiiin Spaaaaaaace! | Spaceship! Spaceship! Spaceship! The producers of Return of the Jedi decided the rebels needed a large capital ship to be their equivalent of the Star Destroyer. 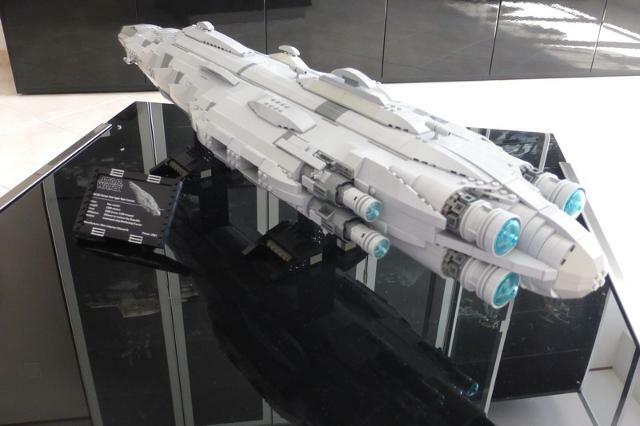 Thus was born the Mon Calamari cruiser, as modelled here by Baciccia_1978. Like the B-Wing I blogged recently, the Mon Calamari filming model wasn’t particularly popular with the special effects team. Whereas the Star Destroyer is all harsh angles, the Mon Calamari ship was made blobby and “soft” to better fit the rebels’ aesthetic; but hence didn’t look that good from any angle and didn’t come across as being particularly distinctive. 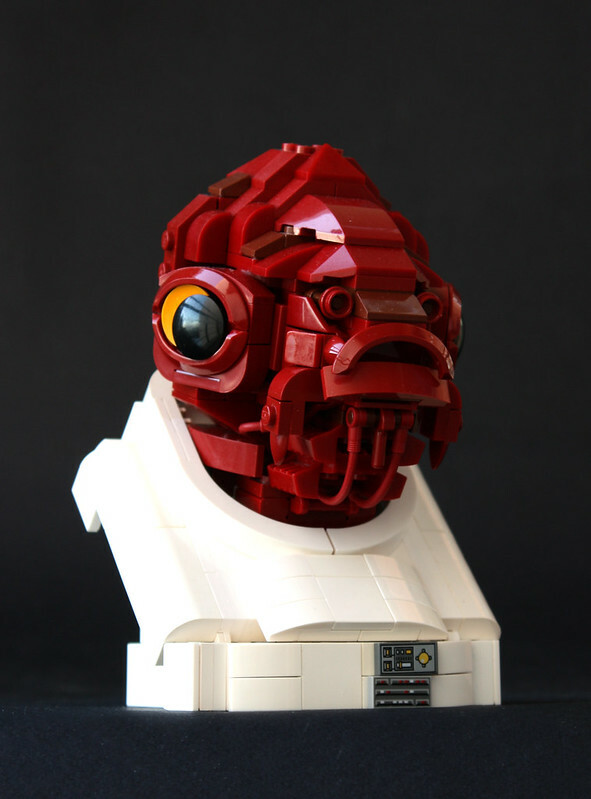 It’s apparently so unpopular that to date LEGO have never made an official set of the Mon Calamari ship (apart from 7754 which is the interior bridge, briefing room and hangar bay). 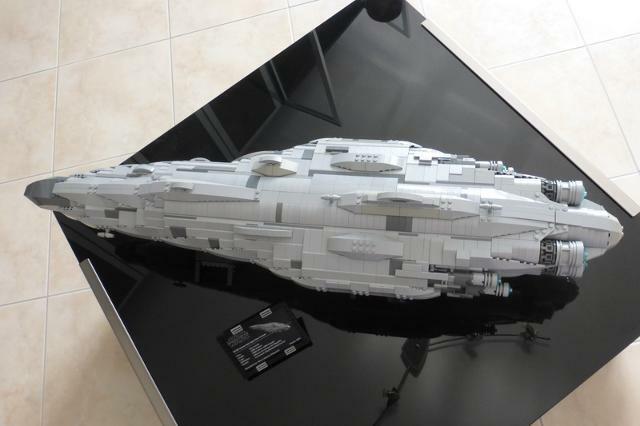 Also whereas there are millions of Star Destroyer MOCs I had to actually hunt out this MOC, which is probably the best one on the internet. 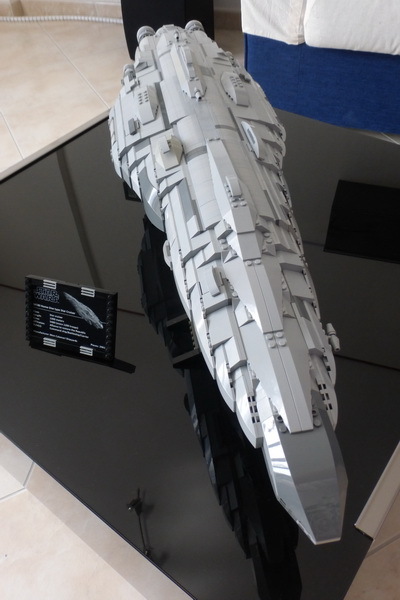 The builder has done a great job of capturing the blobby shaping, with some neat detail around the engines and landing bays at this large UCS-style scale; but it’s still a slightly forgettable design. He could have made strategic use of tan and dark red pieces to capture the slightly patchwork effect of the real thing; but it might have started to look a bit like a quilt. Interestingly, in Rogue One we see a different Mon Calamari cruiser which is kind of similar, except the designers gave it a big elegant fin dropping off the bottom. This certainly helped to make it a more distinctive and interesting design. I couldn’t find a decent picture of that ship, but I DID find this awesome model of everyone’s favourite lobster-headed flag-officer. With me.. “It’s a trap!”. This entry was tagged microscale, star wars. Bookmark the permalink.